"Facing MS backup file corruption? Repair MS Backup File with Windows BKF Recovery Tool"
Everything when corrupted/damaged needs to be recovered for appropriate procedure. Same goes for MS backup data in a Windows computer system. When your Microsoft Windows backup (.bkf) gets corrupted, you want to repair MS backup file immediately by using a proficient Windows backup recovery tool. The much helpful and secure Windows backup storage where you can safely store data items like emails, music, images, pictures, documents and other items without worrying about their corrupt is also not 100% secure. Easy Graphical User Interface (GUI): The Graphical User Interface (GUI) of MS backup repair tool is very interactive and user-friendly for accessing all option easily. Instantly MS Backup File Recovery: It will take just a few minutes to complete corrupt MS backup file recovery process using software. Recovery Unlimited Size of BKF File: The software has ability recovery of MS Backup file of unlimited size (more than 400 GB). 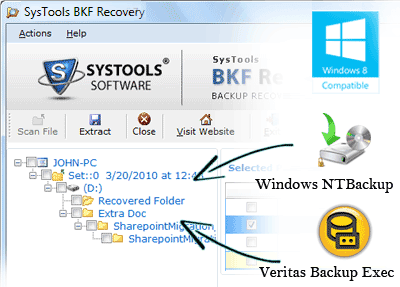 Backup Exec Support: The software repair the BKF files created using either the NTBackup utility or the Backup Exec by Symantec. Cost-Effectively: You can get the Personal License of BKF Repair tool just for $89. Windows Compatibility: All 32-bit/64-bit Windows versions (Windows 8.1,8,7,Vista, 2K, XP, 2003, 2000).